Dedicated to Fr. Kevin Kester and his loved ones. Ezk 1:2-5, 24-28c God's word to Ezekiel: The Lord's hand came upon me. A stormwind came, a cloud with flashing fire; within it were figures resembling four living creatures with human form. I heard their wings, roaring like mighty waters and God's voice. I saw a throne on which was seated a man glowing and surrounded with splendor. Such was the vision of the likeness of God's glory. Ps 148:1-2, 11-14 "Heaven and earth are filled with your glory." Praise the Lord from the heavens, in the heights, all angels and hosts. Let everyone praise God: kings, princes, judges, the young and old, everyone. He alone is exalted, majestic. He has lifted his people. Passionist: The NAB clouds Jesus' explanation of his tax exemption by translating 'sons' as 'subjects' and 'others' as 'foreigners.' Jesus: kings don't tax family, so the Son of God is exempt from paying tax for his Father's house, the Temple. But Jesus pays anyway. The fish symbolizes God's surprising extravagant provision, here the coin. Jesus treated Peter as a son and paid his tax. Jesus didn't have to but also paid our 'tax' with his life to redeem us. At baptism, we became the king's children and heirs. DailyScripture.net: Jesus: We'll go beyond our duty and pay the tax so as not to cause bad example. "Give no offense" = "put no stumbling block in the way" that would cause a fall. Do I evade unpleasant responsibilities? / Jesus predicted he'd endure suffering and death. The apostles were distressed: they'd likely be treated the same. 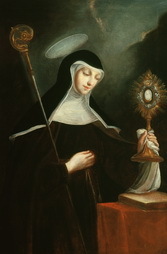 Universalis: St. Clare, under Francis’s guidance, began the Poor Clares. The order's Rule of Life included radical poverty; nuns were to be sustained only by alms. She was a contemplative and a caring mother to her nuns. See Catholic Encyclopedia, Wikipedia. As religious orders struggle with laxity vs. strictness, we oscillate between being too strict and too lax.